Ophelia Melons lays a powerful hit on Raven Seaward of the Throttle Rockets. Photo by Danny Ngan. Ophelia Melons (#88) began her roller derby career in 2008 not as a player, but as a referee – for banked track – in Los Angeles. Later, she played for the Emerald City Roller Girls in Eugene, OR before moving to Seattle a couple of years ago. Six years after putting on skates and grabbing a ref’s whistle, she is one the best, being selected as the Most Valuable Player in last Saturday’s bout for her current team, Derby Liberation Front (DLF) of the Rat City Rollergirls. 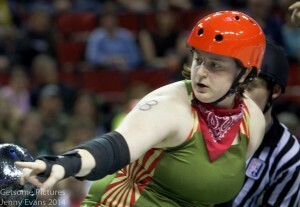 Throttle Rockets, DLF’s opponent that night, voted her as the MVP. “It was my birthday,” said Melons, “so maybe they were just being nice.” Rockets players who woke up Sunday morning hurting in many places from the beating Melons and her teammates put on them would probably disagree, offering more painful reasons for their vote. Melons has always been a blocker. She started 22 of the 44 jams in last Saturday’s match. She thinks the best blockers are also great jammers and vice versa, but her strength is pushing other bodies out of the way on offense, holding them back on defense. “I’ve always been a scrappy kid,” she added. Ophelia Melons lines up for the jam whistle, and sizes up her opponent. Photo by Jenny Evans. Growing up in LA and watching roller derby in its earlier versions she became an avid fan. Her parents soon began calling her their “Roller Derby Diva” and her mom is still her biggest fan. But soccer was her first sport. She played competitively for 15 years and was selected as the number one goalkeeper at the California community college level, but she eventually stopped playing because of knee injuries. A knee injury also caught up with her last season when she had a complete ACL tear in the second half of the March bout against Grave Danger. A year spent in recovery was also a year in which she says she was able to improve her game. She calls her first game back, the season opening match against Grave Danger in January, an emotionally intense time for her. “There’s no better feeling than coming back and winning,” she said. Going into that bout, DLF were slight underdogs, but upset Danger, the three-year reigning league champions. Her given name is Elizabeth Baumwirt. She lives in the Ballard area, does customer service work and is also employed at a popular bar, Conor Byrne Pub, where she keeps things in order at the door. She wears a Rat City t-shirt or sweatshirt most of the time she is on duty, convincing customers to attend bouts and educating them about the sport. Melons said that she has never been on a championship team but hoped that DLF, winners of both their bouts this season and the only undefeated team remaining in the league, could keep their penalties under control. “We will be unstoppable if we can do that,” she said. And those banked track LA Derby Dolls that gave her her first experience with derby? 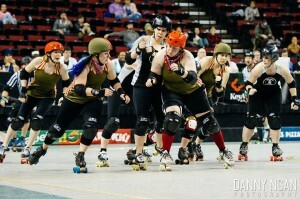 The Rat City Rollergirls sent an all-star team down there in 2012 and beat the Dolls on their own track. Melons is correct, you have to come to Seattle if you want to play with the best.